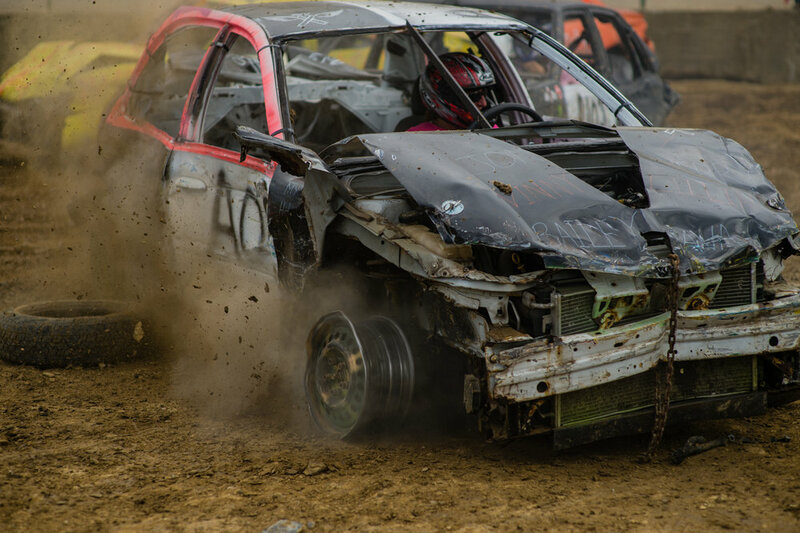 A glimpse into the pit and track culture of demolition derbies throughout Ohio, Pennsylvania, and New York during the Summer and Fall of 2016. I was never into sports. This was my sport. Dad was a firefighter, so I grew up having to work the track. Mom was pregnant with me for my first race. So, it never went away. 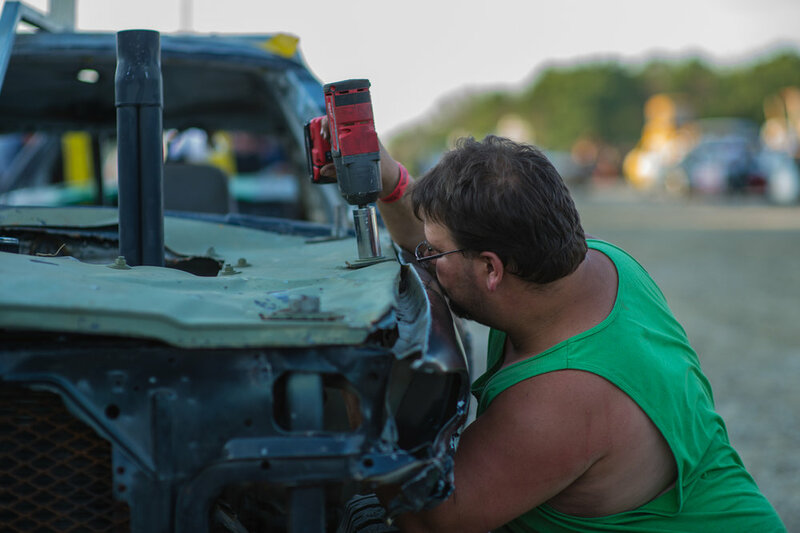 — Dan Thomas, a 30-year-veteran of demolition derbies. 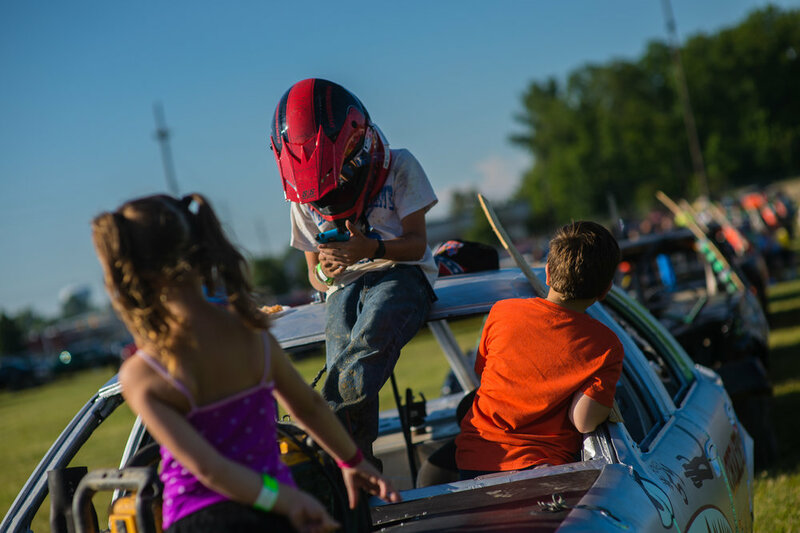 Brooke Erik, 17, hangs out on top of her cousin's demolition derby car in Dunkirk, NY, while family friend Jay Cevic flirts with her. 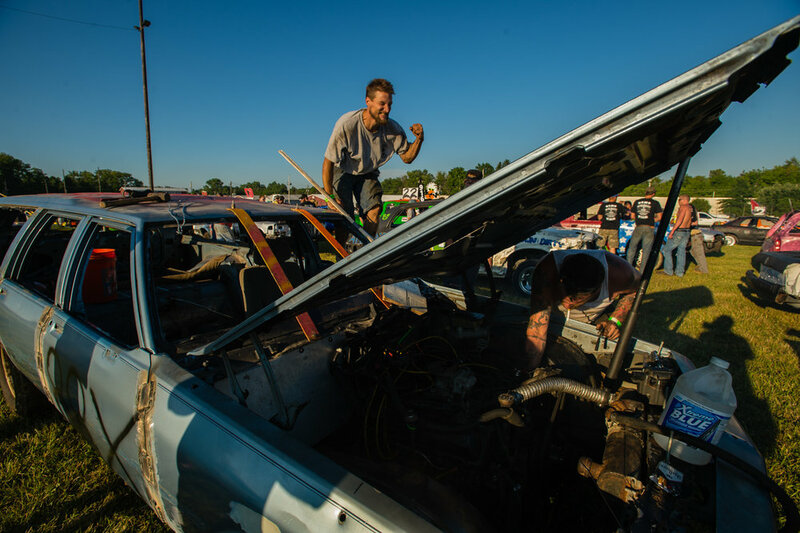 After nearly twelve straight hours of repair to get the car prepped before race time in Ohio, Jason Brasly reacts to a successful ignition by his boss, Kurt Meister. The vehicle had been donated by Brasly's girl friend, whom was looking to get rid of three vehicles. A derby contestant is towed into the inspection pit in New York. 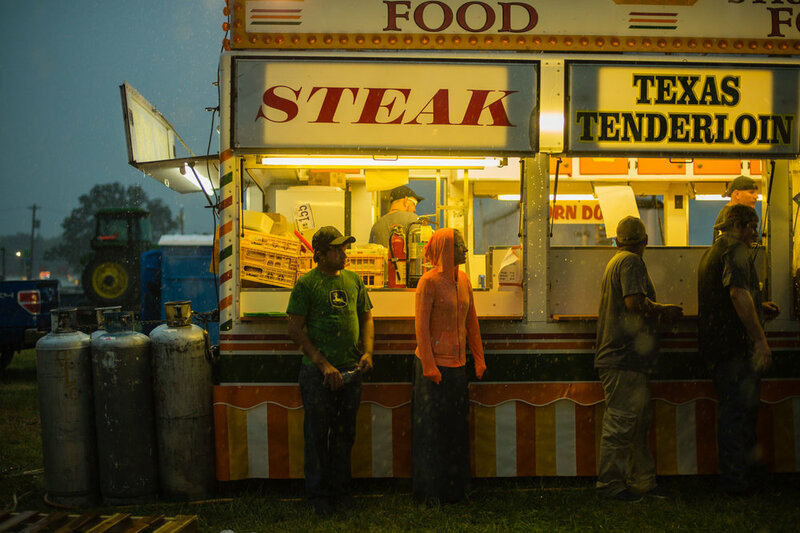 Local volunteers pass the time socializing well before the beginning of races, and nearly half a day before they are called upon to hook cars to damaged to exit the track under their own power. 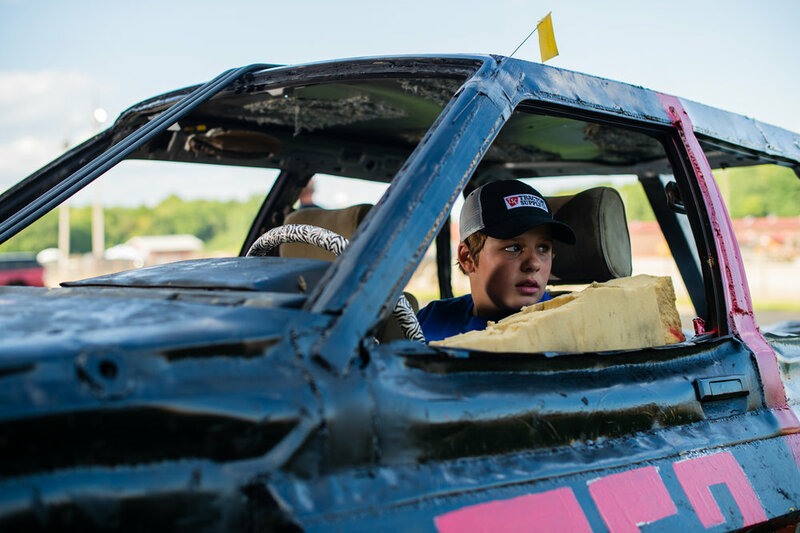 Deagan Foster (left), 13, waits in his demolition derby car as his father completes final tightening of bolts to make the car race ready, Thursday, July 27, at the Summitt County Fairgrounds in Tallmage, Ohio. Deagan, his sister Lilly, and father John, make up what he describes as, the "FFDT", or "Foster family derby team," started by John's father, and passed down over generations. 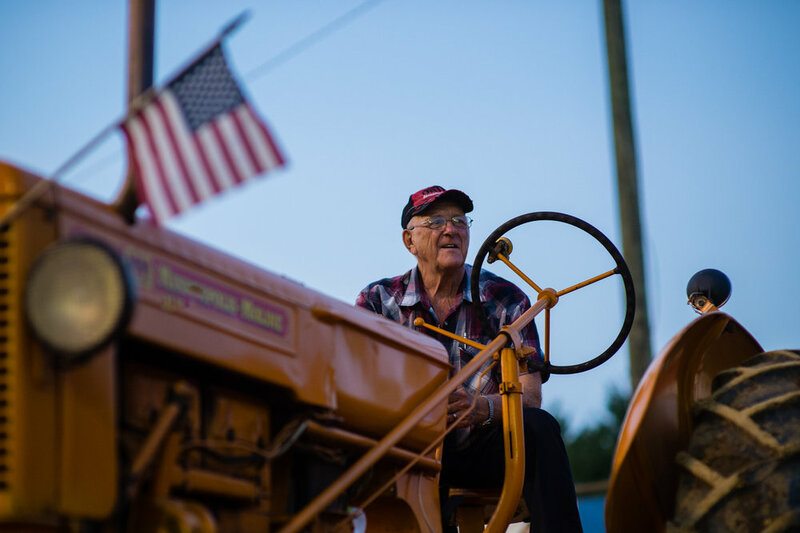 The car Deagan drives is graced with the word 'Pop', in homage to the family's derby patriarch. 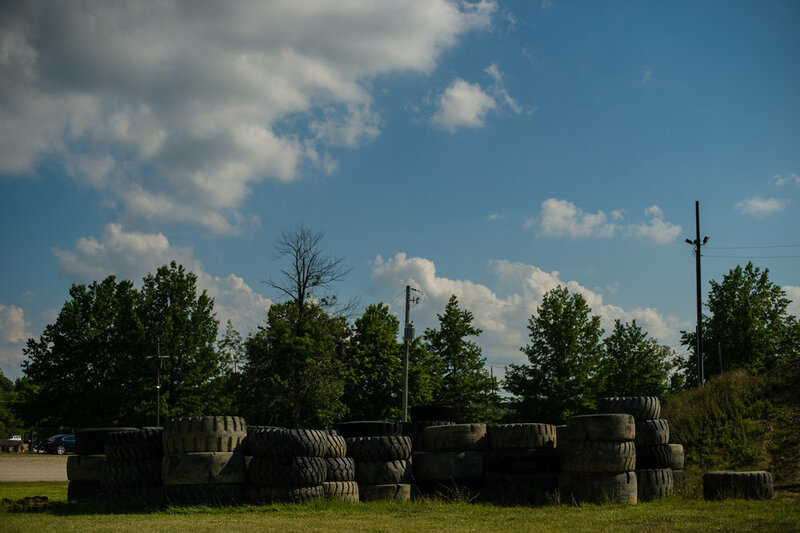 Jacob Hinkle (right), 13, rests on top of his car before the demolition derby at the Summitt County Fairgrounds, Thursday, July 26, 2016 in Tallmadge, Ohio. This will be Jacob's first race, and he " ... doesn't feel nervous at all." 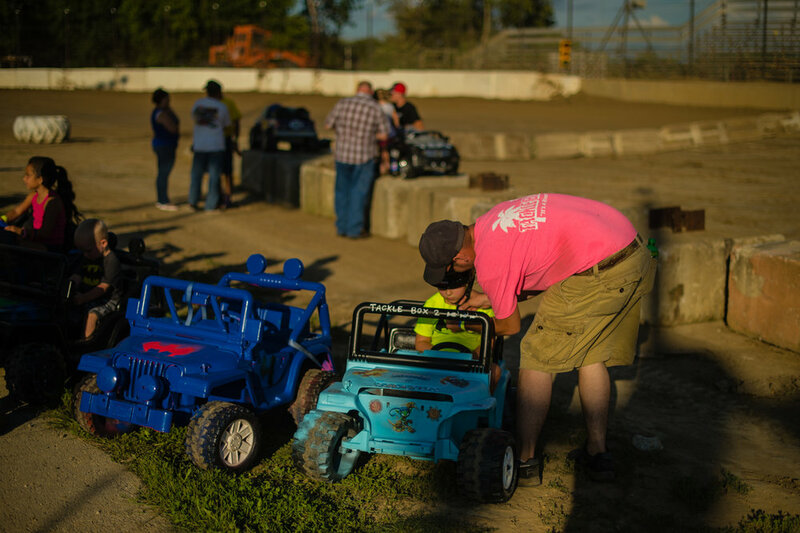 Fathers tow their children's big wheels to the track to prep for the kids' race – a frequently held competition before most demolition derbies. 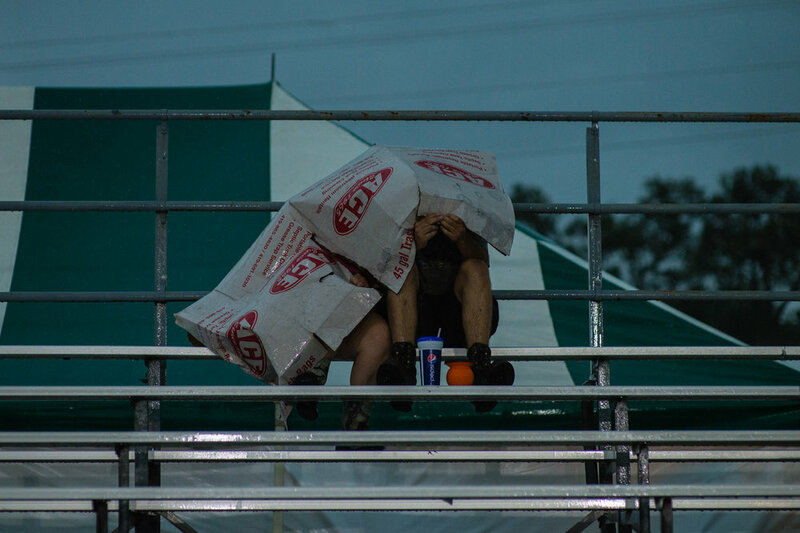 Spectators to take shelter from an incoming storm track well before race time. 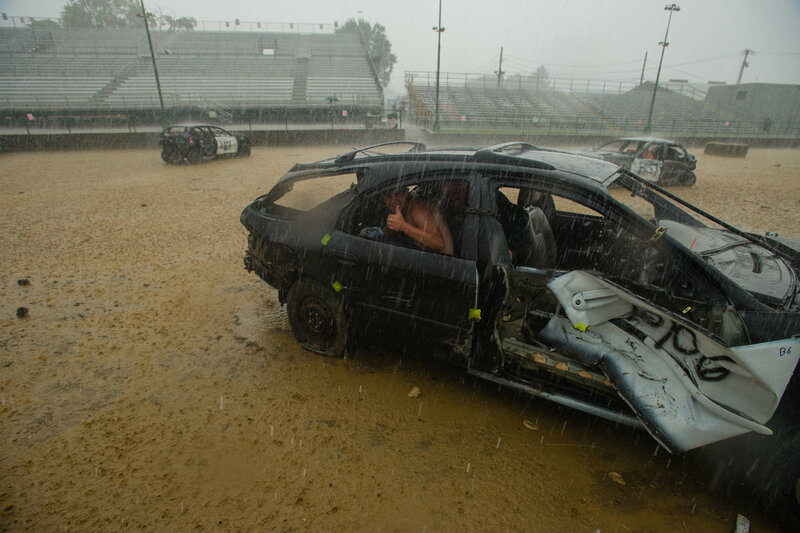 Adverse weather generally only delays a demolition derby, as rain storms are a much welcomed added element to competition. 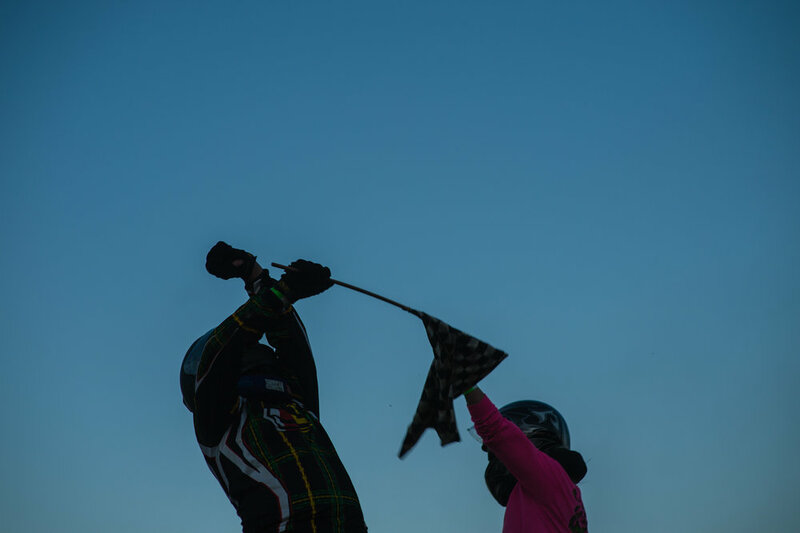 A contestant's sister collects the mud that falls off winning cars from each race. 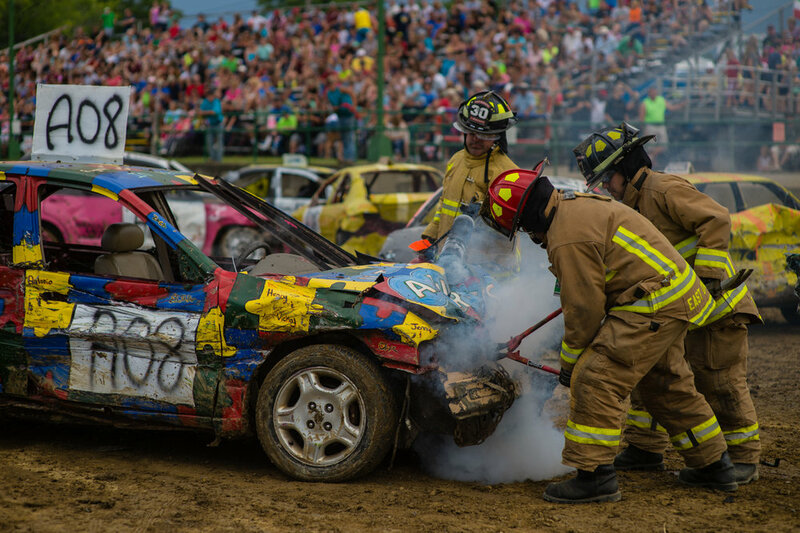 Bottom right: Grafton, Ohio residents Brad Fyfe (Rumble Bee) and Cody Pruitt clash during a combine demolition derby. 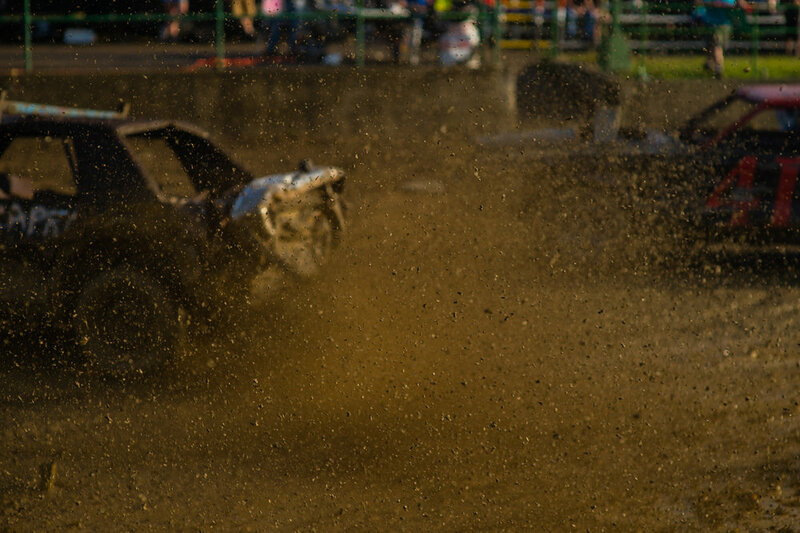 At some point in the evolution of demolition derby, other vehicle such as lawnmowers, school busses, and farm combines were added to possible vehicles to demolish.